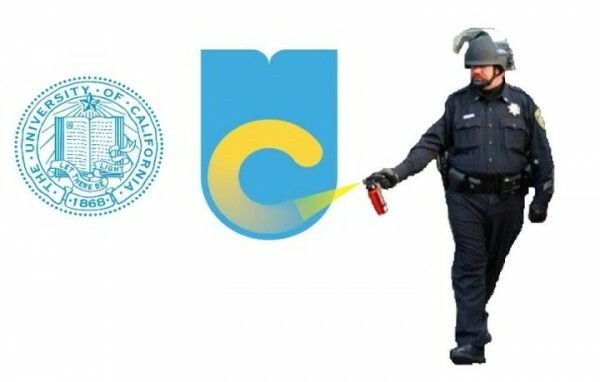 What is all the fuss about the logo change of University of California? Below you will find a link to a news article about the outrage of the logo change and the information presented here is to express The Spiritual undercurrent of the old and new logo and the exceedingly deeper symbolic and social implications. Logos: The two logos are above the old on the left and the new on the right. Below is a list of observational differences in no structured order followed by the spiritual and symbolic undercurrents or the unseen “Why?”. If you find anything we missed please contact us so we can include. New logo is an acronym. Old logo has 8 complete words with a date. New logo has a two letter acronym. Old logo does not have any acronyms. New logo acronym is also two words if you read the acronym phonetically (UC phonetically reads You See). New logo acronym is symbolically the content of the logo. Old logo has the founding date on the bottom of the logo. New logo has two colors. New logo shares the same blue color of older logo. New logo has an additional Yellow color. The C of the new logo appears to be hanging over too far to be the letter C.
Older logo has the ability to look beyond the logo with the white background or whatever color might be the background. Old and New logos have an open book. New logo is a book facing upwards. Old logo is a book facing the reader. Old logo allows you to easily read the visible “A” on one of the pages. New logo doesn’t allow you to symbolically read the words. Old logo has a five point star that is radiating downward. Old logo’s tip of the star is breaching the formal name of The University of California. Old logo has a ribbon that reads “Let There Be Light” in front of book. That ribbon is the ribbon of the very book in the center of the logo. Old logo’s book has an “A” as the first word on top of the page of the book. Old logo reads The University of California and the date upon an unbroken ribbon near the outer part of the logo. There are two unbroken circles one the ribbon of 17 and the circle of dots outside the ribbon. There are dots between every word of that ribbon. Old logo has victorian look. New logo has contemporary look. Now that we have a working list above we are going to break these down to the symbolic differences that correspond with the list. A lot of these overlap with each other and the differences are alarmingly intertwined with one another so you can compare. When we compare the two logos we can easily see the book in the first logo and the symbolic book of the new logo. What does that mean? In the older logo the book is dead center of the logo with the only visible word being the “A” at the top left hand corner of the book. The new logo has no visible words however the acronym UC is visible on the side profile of the book that is open. That leads us to see that you can easily read the book of the old logo being open and facing the reader who can be standing or sitting looking forward with an erect head position. The new logo has a symbolic book facing upwards instead of a real book as you see in the older logo. The reader would have to be bowing their head to read the symbolic book, the reader can be standing or sitting to read this symbolic book. However this symbolic book has no visible text for us to read read. We need more information to compare. What is the book in both these logos? If we know the book that is being read we can get a better understanding of what the logos are saying. Well we can easily read the “A” in the old logo book however that doesn’t help much. Note the “A” seems to be after the beginning and before the end somewhere in the middle based on the way the book looks in the logo. The new logo we do read UC on the side profile of the book. Lets look at the circumstantial evidence of the older book then the newer book. The ribbon in front of the old logo book is actually the placement ribbon of the book itself. What do you read on that ribbon? “Let There Be Light”, where is that from? Answer: The Bible note the two translations. The Young’s Literal translation also known as the YLT is my favorite translation of The Bible however the YLT translation was first published in 1862 and then finally in 1889 therefore the KJV translation would be the one that was considered for the logo since the YLT was so new. That ribbon is reading the very first recorded words God had spoken in Genesis. Genesis 1 & 2 are describing the setting whereas verse 3 are God’s first spoken words where He spoke Light into existence. The “A” is the “Alpha” in the old logo book. “Beginning and end”. The book that is in the center of the old University of California logo is The Bible. You can also see the star above, a picture of God’s dominion and radiating light just above the book. What is the new Logo symbolic book????? Definitely not The Bible and we know this because if you look at the placement of where the UC is in the new logo. You see that it is not the cover of the book or the back binder of the book. It is a picture of the substance of the book itself. Clearly this is undercurrent of the SYMBOLIC BOOK of the new UC logo. The center of the old logo is The Bible and The Spiritual light radiating above the logo as if The University of California is saying that the very core of their teaching is The Bible and The Spirit radiating or overseeing the word of God. Do you see that the UC of the new logo is not the word of God but the word of UC? The symbolic word of UC that you can’t read unless you bow your head. UC replaces God and is the Light The Spirit and The Word. ARROGANCE! Look at that “C” of the new logo and if you look carefully it is bowing or hanging over too far to be the letter “C”. Now we can see in the old logo reading the core book one can look straight ahead to read the words of The Bible that is enlightened by the Star (Spirit of God). The new UC logo you have to bow your head to be able to read the symbolic book. The old logo’s book is The Bible the new logo’s symbolic book is the word that UC teaches. Well the two verses above say not to bow your head down to other gods. Therefore one can deduce you have clarity when God’s word with the star giving light so that you can read with your head straight a picture of liberty and freedom and clarity. UC’s new logo has you bowing down in submission or under the dominion of the book. Let us see if dominion and submission is found in the new UC logo. Look at the students are sitting in a “C” position on the ground in fear and in submission while the police officer is clearly using unacceptable force. The students are BOWING THEIR HEAD just like the yellow “C” in the logo! 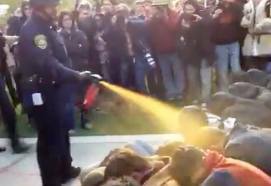 Look at the color of the pepper spray… YELLOW! The officer is wearing BLUE! Yes the blue of the newer UC logo is more subdued than the police officer however the new UC is more subtle in it’s meaning. Someone had posted this modified UC logo below which oddly enough is very accurate regarding what had taken place that November 18th, 2011. This also parallels the dominion upon the students. How about something even more bazar look at the two letters in question. U & C and look at the phonetic words again U = You and C = See. Now use the the phonetic word of U and the letter C and look what you get: “You C” or “You are the C” which is clearly evident with all the evidence presented thus far. That ties the student with being the “C” of the logo or the one in fear and under dominion. This is also compounded by the fact that when you look at the acronym UC what do you see? Do YOU SEE the dominion which is a departure from God giving light to the Bible in contrast to the Book of UC. Not strong enough? How about this: The C in of itself is the person as we demonstrated and yes the yellow C is representing the letter C. However if you look at the older logo there are two unbroken circles one is the circle of dots which each dot in of itself represents eternity of an unbroken circle and also the ribbon which is also an unbroken circle. Note the star pierces the top of the ribbon which is God’s dominion over eternity. Or God’s dominion piercing The University of California itself! The new logo “C” is the closest the new logo comes to eternity. That eternity is not complete and why is that not complete? Remember earlier the Star (God) shining His Light upon The Bible? We don’t have God or God’s Light shining upon The Bible we have “The Book of UC” that attempts to replace God, His Light and The Bible. Well clearly without God and His Light and His word we won’t have eternity. The yellow C of the new logo represents the incomplete eternity. Another failure. Ok from the psychotherapy perspective we can see the “C” being a person hunched over or bowing. Well if you look at the bottom of the C and imagine that is the feet of the person then you know there is no grounding. If you look at the top of the C you see that is the brightest yellow. Well Fear is the motivating component of WILL! When you have tremendous fear you will use tremendous WILL. The Heart is missing within the person that is the C because the heart and spirit is what would be completing the circle that is why you have fear instead of faith. Fear breeds will whereas faith (heart & spirit) breeds courage. The old logo presented the eternal light whereas the new logo is conforming to the times. One is timeless and the other sways with the wind. Looking at the victorian old logo has so much more intricacy in contrast looking at the newer logo makes me think of Justin Bieber and how policy has shifted away from truth and towards popularity. That is another reason the new UC logo fails in that this was an attempt to please the masses instead of stand upon truth. To sum this up in one sentence. Without God and His Light shining upon His Word in the center of all your endeavors all you are left with is darkness, fear, ignorance and subjection to dominion by your will! Do you feel we are stretching? Yeah well look at this UC produced video about the logo change below in light of everything you read above. Look at the first and last thing action that was done in the video. How is it this is supposed to be higher learning and they don’t even realize what they are saying in their endeavors? At the one minute and thirty second mark of the UC video you notice a student looking into the microscope. If you carefully consider that picture you can also see that it looks like the student is praying. Symbolically with the microscope enhancing his vision to “SEE” and he is praying or worshiping his god. Wearing the UC Blue colored sweat shirt we know he is a marketing branded student. At one minute and thirty five seconds a woman hands the woman holding the book of UC a pair of “UC Let There Be Light” branded flip flops. The next scene is a picture of the woman now wearing the flip flops as the camera focuses on her feet standing on sand. Sand is very significant since the word of UC builds a foundation that you stand upon and in this case it was sand. Does The Bible say something about that foundation of sand and even the water in the background of the same scene? The more we look the more we find. When you consider the logo and video was endeavored by the intellectual managing body of the university unbeknownst to them everything you read here leaves your mouth agape with astonishment at how blinded they really were. They endeavored to become the prophets of “Let There Be Light” and ended up with dung smeared upon their faces. The pride of their wisdom has become foolishness. Yes that is in The Bible as well! What about the word “LOGO”? We have been expressing aspects of the change of The University of California’s logo and supporting video. Since we determined this is a Spiritual matter removing The Bible or The Word of God from the old logo let us look at the very word LOGO for a moment. The origin of the word “logo” is Greek (logos) which means WORD! Yet again another very tremendous connection that the removal of The Bible from the old logo represents the removal of God’s word which was replaced by “The Word of UC”. No wonder God is pissed at UC. The word logos was also in the Original Greek texts of the New Testament of The Bible! Quoted Blue Letter Bible definition of the Greek word logos which means word. 3. In John, denotes the essential Word of God, Jesus Christ, the personal wisdom and power in union with God, his minister in creation and government of the universe, the cause of all the world’s life both physical and ethical, which for the procurement of man’s salvation put on human nature in the person of Jesus the Messiah, the second person in the Godhead, and shone forth conspicuously from His words and deeds. How about the first verse in the Old Testament that talks about WORD? Note in the old testament the Hebrew word is “dabar” that is translated to word. How about the last place we find word in The New Testament which is the Greek word “logos” translated to word? Remember earlier we read about BOWING DOWN? Read the above verse again. Who are you bowing down to? UC? The beast that replaces God?